Beautifully textured weaves and enticing embroidery, bronze and brass artefacts, shell and silver jewellery, baskets and masks, classical Tanjores, and Madhubani and Phad panels beckon visitors with a heady mix of quality, classicism and innovation. Looking for leather puppets and panels or a special puja mandap, stone flowers or a perfect Buddha head in terracotta? Or a particularly exotic filigree rose water sprinkler? You can pick up all these and more and also get to meet the people behind the creations at the ongoing Gandhi Shilp Bazaar, at the Exhibition Ground. Munuswamy’s horses are decorated with terracotta baubles, payals, bells and necklaces. They have a special sheen. One striking piece is the exquisite Buddha head. Perfectly proportioned features and a serene face make it a truly harmonised piece of art. Artisan Shameer from Kerala has carved a superb mandap out of rosewood, which is an exact replica of the Ayyappan temple. With the typical pagoda-like roof of Kerala temple architecture, the mandap also features beautiful woodwork and hand crafted brass fixings. Says Shameer: “I buy rejected rosewood pieces without grains from the market and fit them in the shape of a mandap. All the carvings, etching and the architectural details are hand-crafted by me.” The mandap is truly a one of a kind. So is the lovely stone bouquet of flowers done by Odisha’s Ashok Kumar Maharana who belongs to a family of sculptors. Ranitha Rao, leather puppeteer and State awardee, sits surrounded by his wall hanging birds and animal mobiles in which peacocks, parrots, monkeys and camels join in seamless harmony. He is busy drawing an ink outline of Radha and Krishna using a special kalam (pen). Once the beautiful outline is done, his wife does the delicate perforations. Later he will paint the surface with bright vegetable colours. Many of the wall hangings depict scenes from the epics. At the Bazaar, one gets a chance to interact with the artisans, discuss the process and history of their craft and catch a glimpse not only of the products but a way of life where creativity and colour meet in marvellous synergy. 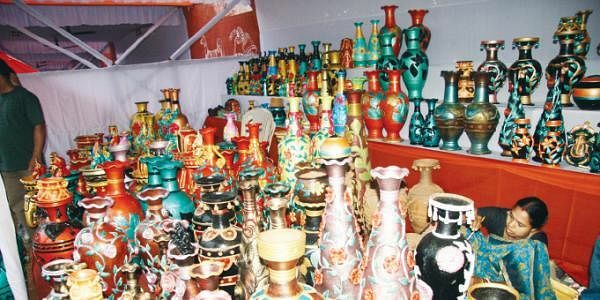 The Gandhi Shilp Bazaar is on view till October 18.